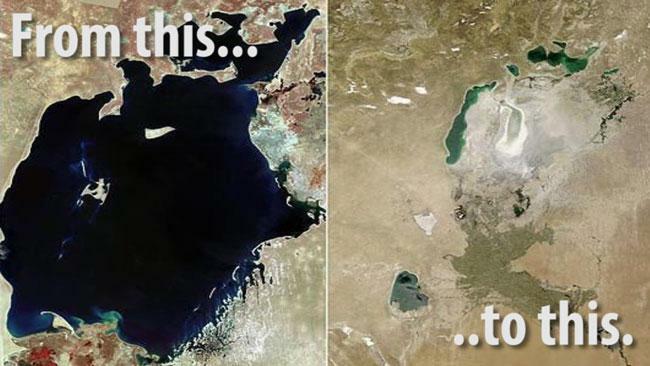 Once upon a time there was a wonderful lake in the border region of Kazakhstan, Uzbekistan and Turkmenistan. The lake was fed by two abundant streams, the Amu Darya from south and the Syr Darya from east. The lake’s area was 68,000 square kilometres and it was considered the world’s fourth largest inland sea. Using a lot of energy (even a nuclear bomb was detonated in this area), in a single lifetime people caused a total ecological disaster in the region. 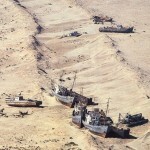 The picture of NASA below shows that what has left from the Aral Sea is nothing but a small pond or a drying up puddle. See the full story of the sea and local people with a lot of photos and film here.